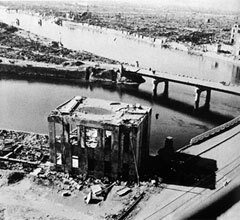 A T-shaped bridge at the junction of the Honkawa and Motoyasu rivers near downtown Hiroshima was the target. At 8:15 a.m., Little Boy exploded, instantly killing 80,000 to 140,000 people and seriously injuring 100,000 more. 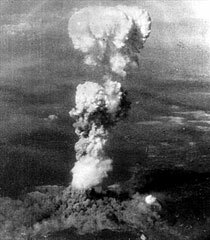 The bomb exploded some 1,900 feet above the center of the city, over Shima Surgical Hospital, some 70 yards southeast of the Industrial Promotional Hall (now known as the Atomic Bomb Dome). Crewmembers of the Enola Gay saw a column of smoke rising fast and intense fires springing up. The burst temperature was estimated to reach over a million degrees Celsius, which ignited the surrounding air, forming a fireball some 840 feet in diameter. Eyewitnesses more than 5 miles away said its brightness exceeded the sun tenfold.